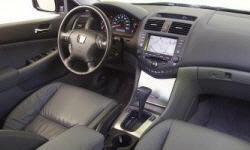 2005 Honda Accord Pros and Cons | Page 1 of 1 | Why Not This Car? What drives people to buy (or not buy) a certain car? 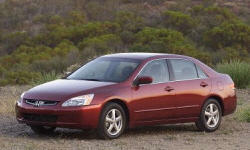 TrueDelta's members share 2005 Honda Accord pros and cons based on their real-world driving experiences. Very quick and responsive 255hp vtec/hybrid combo. Shifts very smoothly and is not "clunky" when shifting down. When I was looking for a car this was the highest rated family sedan. I also owned a 97 Accord and it had been performing well. 81,000+ miles. Not one issue, at all. Best car i have ever owned for reliability. At 255hp, VERY powerful family sedan. I have a very narrow drive way, and the fold-in side view mirrors were a must, or the car would have to be a smaller model. It is clean, simple to use, and with great switch gear. Holds value well, good investment. Havent had one problem since bought new in 2005. Baby the car and change the oil at 3500 mile intervals myself since I have a thing about sediments and such left in the engine over time. We bought a DX with dealer-installed AC. $13,000 plus a Plymouth Breeze with a blown head gasket. Not bad for a brand new car with 11 miles on the odometer. Smooth shifting and good horsepower to weight ratio. Nice feature that holds the speed on hill descents (uses torque converter for "engine braking").